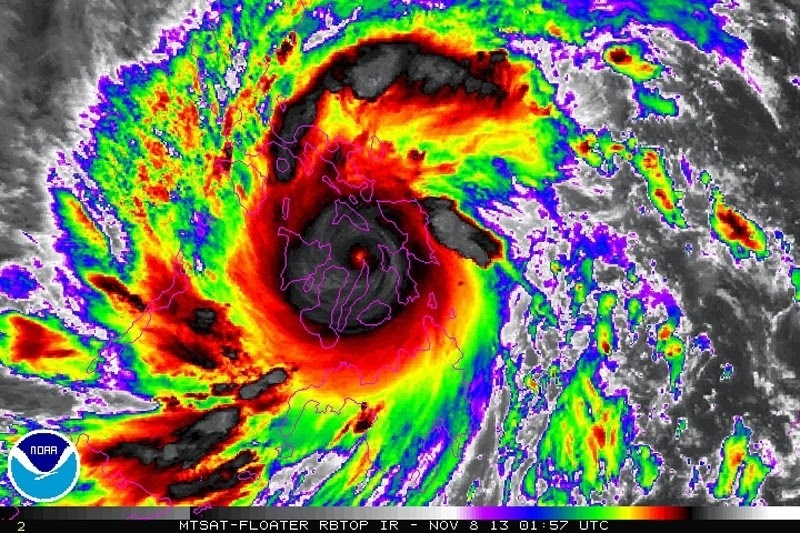 · The super typhoon “Yolanda” (“Haiyan”) that hit the Visayas islands in the Philippines on November 08, 2013 made a “colossal storm surge” that engulfed the entire city of Tacloban. 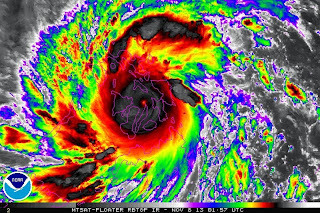 · A super typhoon named “Yolanda” (“Haiyan” –International name) hit the Philippines on November 08, 2013 leaving thousands of people dead and hundreds of thousands suffering from fear and hunger on the aftermath. · A hurricane is a rotating tropical storm with winds of at least 74 miles (119 kilometers) an hour. · The eye is the low-pressure center of the hurricane. Air sinks inside the eye, clearing the skies and making it relatively calm. · A ring-shaped eye wall surrounds the eye and carries the storm's most violent winds and its most intense rains. · Every U.S. state has experienced twisters, but Texas holds the record: an annual average of 120. · Tornadoes have been reported in Great Britain, India, Argentina, and other countries, but most tornadoes occur in the United States. · Once a tornado hits the ground, it may live for as little as a few seconds or as long as three hours. · Thousands of quakes occur every day around the globe, most of them too weak to be felt. · Every year about 10,000 people, on average, die as a result of earthquakes. · Most tsunamis, about 80 percent, happen within the Pacific Ocean’s “Ring of Fire,” a geologically active area where tectonic shifts make volcanoes and earthquakes common. · Tsunamis’ speed across the sea is up to 500 miles (805 kilometers) an hour—about as fast as a jet airplane. · Most floods take hours or even days to develop, giving residents ample time to prepare or evacuate. · Others generate quickly and with little warning. These are called flash floods which can be extremely dangerous, instantly turning a river into a thundering wall of water and sweeping everything in its path downstream. · In the United States alone, landslides cause an estimated 25 to 50 deaths and $3.5 billion in damage each year. · In Asia, according to Mines and Geosciences Bureau (MGB) in the Philippines, up to 80 percent of the country's total land area is landslide prone, making the country the fourth most exposed to landslide risk, after Indonesia, India and China. · On average, in the U.S. there are more than 100,000 wildfires, also called wildland fires or forest fires, clear 4 million to 5 million acres (1.6 million to 2 million hectares) of land every year. · About 1,900 volcanoes are active today or known to have been active in historical times. · Almost 90 percent of volcanoes are in the Ring of Fire, a band of volcanoes circling the edges of the Pacific Ocean. · The eruption of Mount Pinatubo on June 15, 1991 in the Philippines produced the second largest terrestrial eruption of the 20th century after the 1912 eruption of Novarupta in the Alaska Peninsula. · According to scientists’ estimation, there are more than 260,000 people who have died in the past 300 years from volcanic eruptions and their aftermath. Hurricane? Cyclone? Typhoon? What’s the difference? Actually, they’re all the same, but they just use distinctive terms for a storm in different parts of the world. According to the National Geographic, these storms are called hurricanes when they develop over the Atlantic or eastern Pacific Oceans. They are called cyclones when they form over the Bay of Bengal and the northern Indian Ocean. They are called typhoons when they develop in the western Pacific.